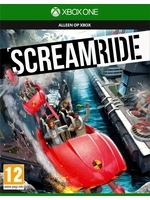 Scream Ride has 3 game types. ScreamRider: Ride a coaster and try to keep the coaster on the track whilst forefilling target goals in order to process to the next stage. Demolition Expert: Destory building using cabins with the people inside, the player is required to hit various goals in order to rack up enough points to move on the next stage. Engineer: Engineering mode, players are tasked with engineering puzzles where the player must build and complete a coaster with limited resources, whilst keeping the ScreamRiders thrilled and Entertained. Thank you Microsoft for providing me an XboxOne code. Engineer videos will come soon. Reminds me of Nvidia Super Sonic Sled tech demo. Just less impressive. It's actually a lot of fun...I'm really enjoying the demolition games. Trying to hit the targets to forefill stage objectives is very entertaining.